Aubergine chilli salad is a very popular dish. Not only is it very tasty, but it is also a healthy meal option. some virgin olive oil along with a pinch of salt and pepper. To prepare your aubergine and chilli pepper salad first, making use of a large saucepan, boil some water. Then, after you destalked your aubergines, cut your aubergines into quarters. It is probably best to cut your aubergines lengthwise. Then cut the flesh into strips. If the strips are very long when you cut them, it may be necessary to chop them in half. After this stage of the preparation has been completed soak the cut sections of aubergine in a large bowl of water for approximately 15 minutes. The water should have by then turned a brownish colour. The next stage is to drain all the water from the pieces of aubergine and then, using boiling water in a saucepan, blanch them for approximately 2 minutes. When you have finished doing this drain the aubergines and lay them out on a clean cloth before patting dry the pieces of aubergine by placing another cloth over them. The next stage is to carefully place your pieces of aubergine in a serving dish, which is wide and shallow, and lightly sprinkle with garlic, that has been thinly sliced, along with salt and pepper, oregano and chopped chilli pepper. Once all this has been completed just add a dash of vinegar and 2 tablespoons of olive oil, before leaving your aubergine and chilli salad to marinate for approximately 45 minutes. This should serve 3 or 4 people. It is also possible to add other ingredients to the salad, depending on your personal preference. These can include things such as tomatoes (make sure you core and dice these first before adding them to the salad, coriander, cumin seeds, hot chilli flakes, cayenne pepper and lemon juice. 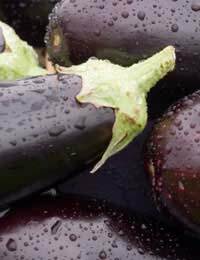 Making a roasted aubergine salad is another option that can be considered. 1/2 a cup of walnuts, that have been chopped, 1/4 of a cup of vinegar along with salt, pepper and oregano. First cut the aubergine into cubes before placing in a bowl of water which has salt and the juice of one lemon added. After removing all excess water place the aubergine in a pan before adding the pieces of pepper, onions, garlic, salt, pepper and sugar. Once this has been completed add 2 teaspoons of vinegar along with olive oil and then blend together. Place the ingredients in an oven set at 170 degrees C, gas mark 3 and roast until the aubergine has turned a light brown colour. After removal from the oven add some walnuts along with oregano and allow the roasted salad to cool before eating. This should be enough for two servings.